James M. Cooper, a Barrister and Solicitor, is Institute Professor at California Western School of Law in San Diego, and serves as Assistant Dean of Mission Development and Director of International Legal Studies. There are few topics so large yet so uncovered in the academic literature as the Amazon Basin. Much of the area that connects nine South American states, hundreds of indigenous peoples, dozens of multinational corporations, and the world’s lungs, remains unexplored and demographic density is still low. 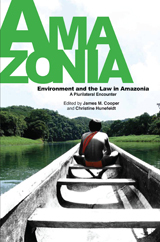 This important book sets out how the Amazon Basin’s indigenous self-determination movements meet corporate profiteering and where extreme poverty, natural resource stewardship, and the vagaries of the international commodities markets meet. The environment and the law are disciplines at the heart of the debate concerning sustainable development, economic justice, and unfair trading practices. It is the intersection of these disciplines that provides us with an opportunity to explore how activist public policy, increasing transnational litigation, enlightened global governance, and the equitable international distribution of public goods will play out on the world stage. Illustrated: Illustrated with a DVD containing Devin Beaulieu’s El Perro Del Hortelano and James Cooper's Global Climate Change. South American governments seem, in most cases, either irresponsible in their failure to recognize the impending environmental catastrophe, or unable to face the danger in an effective manner. However, when it comes to the environment, and especially when the challenges are long-term (which in politics means “beyond the term in office of the current government”), negation of the issues and collective action paralyses are not the exclusive patrimony of South American governments. We see a similar pattern in those of the United States, most of Western Europe, Japan, and China. Only the prevalence of short-term horizons among policy-makers can explain the inability of the world’s governments to co-operate in the control of climate change. Yet, political institutions do make a difference. Once the public, political elites, and government officials of the industrial countries and China reach the conclusion that concerted action against environmental threats is both necessary and urgent, they will have the organizational and financial resources for designing and implementing effective policies. These are governments whose state capacities (regulatory, extractive, and developmental) are generally strong. The situation is quite different in most of South America. Whenever academics and public intellectuals within the region analyze governmental passivity or ineffectual response to the looming ecological catastrophe, conspiratorial explanations, which place the blame for this state of affairs on external actors, are standard: the exploitative policies of developed countries, the voracity of multi-national corporations, the “comprador” nature of domestic governments, etc. However, as Ambassador Jeffrey Davidow points out in his afterword, central determinants are the weakness of political institutions, the ineffectiveness of most governments in the region in designing and implementing environmental and economic policies.